Dr. Dakshayani D is a Gynecologist and Infertility Specialist in Anna Nagar, Chennai and has an experience of 20 years in these fields. Dr. Dakshayani D leading the clinical team as a Senior Consultant at Apollo Fertility in Anna Nagar, right from the inception of the center. 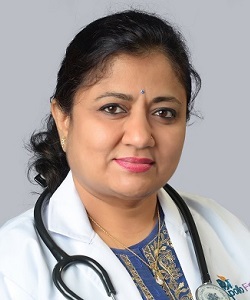 She completed MBBS from KIMS, Bangalore in 1988, DGO from Trinity, Dublin in 1996 and Diploma in Reproductive Medicine (Germany) from International School of Medicine, Kiel, Germany in 2003. She has done researches in the field of reproductive endocrinology and clinical embryology and published research papers in various international Journals. ISAR (Indian society for Assisted Reproduction).